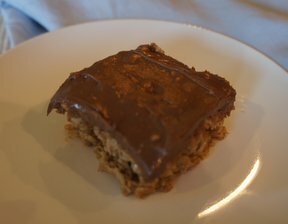 A layer of soft caramel and chocolate in between an oatmeal-cookie like crust - the perfect combination. Preheat oven to 350°F. Grease a 13x9 inch baking pan. In a medium bowl, combine butter, flour, baking soda, oatmeal, brown sugar and salt. Stir to combine. Press half of this mixture into the bottom of the prepared pan. Bake for 10 minutes. Cool slightly. 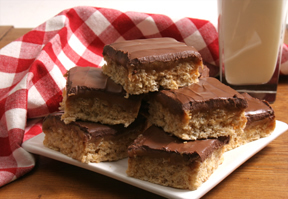 Combine caramel topping and flour. Sprinkle chocolate chips over crust. Drizzle caramel mixture over chocolate chips. 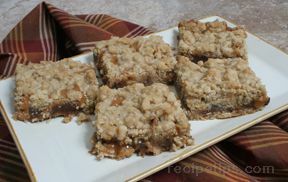 Crumble remaining oatmeal mixture over the top of the caramel. Bake for 15 minutes. Let bars cool before cutting.